March 25, 2014 | David S. Maldow, Esq. 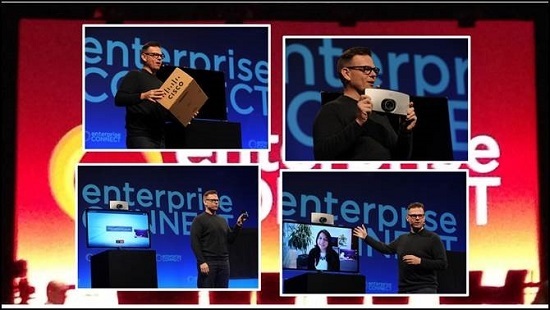 We learned way too much at Enterprise Connect 2014 to possibly cover it in just one take. As you can tell by our preview article, we were definitely looking forward to this one. We were not disappointed, as we enjoyed the opportunity to catch the some great panels, and talk to EVERYONE. Let's get started with some quick notes on the keynotes and sessions, and then dig in to round one of our booth crawl. Our industry has a deep field of experts, so the panels tend to be pretty good. But this year there was more buzz about the quality of the panel sessions than usual. One exhibitor complained (tongue in cheek) that the sessions were so good that they were taking away from the time he had planned to walk the show floor. Even notorious industry cynic David Danto was appreciative of the how the sessions this year had more straight shooting, and less pie in the sky. I got a very unique perspective on the Keynote sessions, as I was checking into the EC smartphone app during the event. It supports an internal feed of updates, similar to Twitter, that only the real geeks seem to have found. People were "tweeting" there a little more freely than they might on their real feeds. That being said, the buzz on Rowan Trollope's Keynote was very positive. Which is a bit surprising considering how much this crowd loves to beat up on the industry leader. To get the scoop straight from the source, please read Rowan's blog post from the day of the event. Also please see my recent coverage of their pre EC announcements and new Cisco products. As far as the Cisco / Google partnership, I think there could be a lot more to that than a simple WebEx on Chromebook demo. The Avaya keynote was packed and CEO Kevin Kennedy had a strong story to tell having provided the network for the recent Olympic games. The athletes and journalists at Sochi were quick to share their experiences about poor conditions at the games. If there were network issues, it would have been a huge social media nightmare for Avaya. This was a very high profile, and risky gig, even for a heavyweight like Avaya. They deserve credit for what appears to have been a flawless execution. That being said, there was a mixed buzz in the audience with a minority somewhat panning the speech. This was a tough crowd. 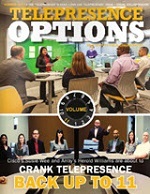 However, the criticisms were limited to elements of the presentation itself, and not Avaya's messaging or offerings. Gurdeep Singh Pall from Microsoft (the man behind Lync) gave the final keynote. He had a great message, and presented it to what should have been the most receptive possible audience. Alas, ironically those closest beholden to the vision of visual collaboration and all of its benefits, may not be ready to hear it coming from Microsoft's lips. Regardless of who is doing the telling, the value of video communication, and the feel good, real life stories of how it is changing the world is a beautiful message. As an industry Pollyanna, I am very happy to have the big boys from Redmond joining in our chorus of Kumbaya. But my fellow analysts did roll a few eyes and mumble a few "tell us something we don't know" type of lines. Bottom line, Lync is a big part of the discussion and eventually it has to get video right. Microsoft is now a VC company, and a big part of our little world. Walking the floor is my favorite part of the event. Touching the products and talking to the people behind them. At this time there is so much great activity in our space. The competition for attention and mindshare is amazing. Even though other large events are pending, everyone had something interesting to talk about. In this market, it isn't enough to have a solid service in the space, you have to have at least one key differentiator, new feature, leading capability, SOMETHING to make the analysts smile or you are dismissed as boring. What an industry! 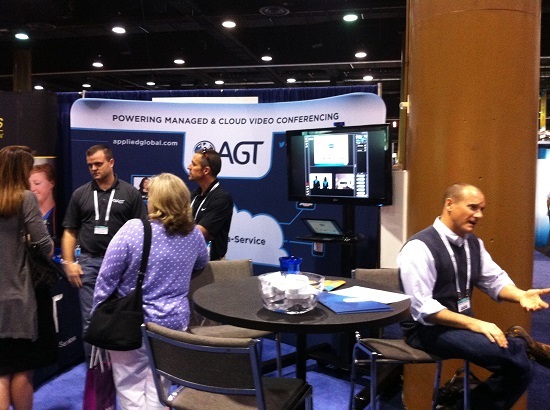 AGT has a great track record for integration and managed services. They are on the short list of companies to go to when you need to get it up and running, and keep your users happy and productive. When the cloud took our industry by storm, they had to look into ways to provide cloud services. What better way than to offer it themselves? Risky move, when there were outsourcing and partnership options available, but it turned out for the best. Their cloud service is a stand-alone success, allowing AGT to renew their focus on growing and improving their managed services, which continues to be their core offering. The result is that AGT now fits the full needs of a greater market segment, and is well positioned to grow in various directions, by offering new cloud services to existing managed customers, and to find new customers in the cloud market, who may not yet realize they actually need managed services as well. We got the hook-up with a demo account, and will be sure to share what we learn. Funny how times change. BlueJeans started out as the VC Company without an endpoint. A friend to all, sitting in the middle with no interest in competing with the endpoint vendors. When BlueJeans finally did create a browser based WebRTC plugin, they did so with little fanfare, and didn't call it an endpoint. I seem to recall them referring to it as "an option" for their users. Jump forward a year and the majority of their connections are now occurring over this "option." Whether they admit it or not, BlueJeans now does endpoints, which means they have talent like Tedd Fox working on UI design. I took a peek at his latest iOS app and it was pretty slick. Very user friendly and clearly designed with iOS swipe / tap functionality in mind, not as an afterthought. Check out our recent coverage for more info about the industry leader in interoperability. Did I try to get the Vidyo exec team to address the rumors? Absolutely. I did my best, but I have to admit I couldn't get so much as a wink, despite several rounds of drinks. Sorry, no inside scoop here, and they do honestly seem very happy with their current course, but it is no secret that they now have the talent on the business side to help them take this thing any way they want to go. On the technology side, there was plenty to see. 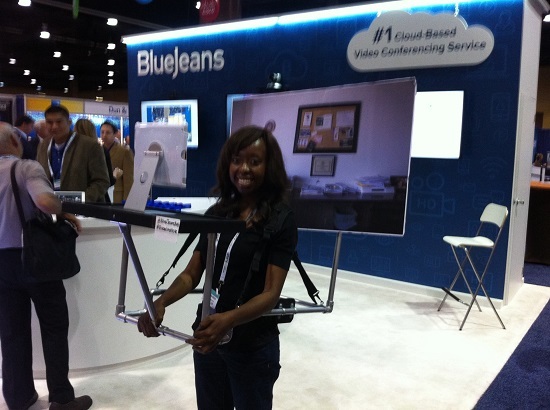 A walk around their booth is a mixture of cutting edge product demos, and bleeding edge tech demos. I was particularly interested in the call center template they were demonstrating. To be clear, Vidyo is not interested in operating call centers, or even in selling packaged, ready to use, call center software, or offering it as a service. However, their technology can be easily adapted to build and support your own call center (or call center service), and they are providing a sample template to show how that can be done. Just one of the many possible implementations of the VidyoWorks platform. For more information about Vidyo, please check out this free White Paper on Visual Collaboration for Small to Medium Enterprise. Newcomers to the industry are often puzzled by the concept of room control systems. After all, how hard is it to really use default UIs for the technology in these meeting rooms? The answer is simply too hard, resulting in underutilized technology which fails to provide ROI. 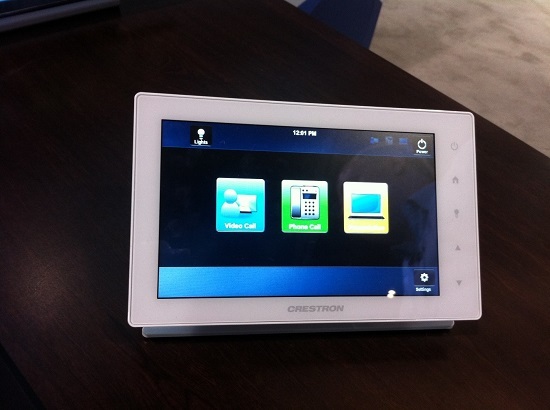 What makes a Crestron UI superior? Because this is what they do. While some VC companies have a great UI department, it is generally still secondary to the video team. Crestron is really just about making things usable, and the Crestron Smart Space applies all of the benefits of Crestron control to any VC meeting rooms using equipment on their supported list. As one of the heavy hitters in the UC market it is great to see Mitel taking a hard look at the video portion of their UC solution. Some UC providers seem to think that it is all about IM, with audio as a higher level of connectivity, and video as an afterthought. A UC provider that "gets it" wants to give their users all of the productivity, and quality of life, benefits of video as part and parcel of their offering. 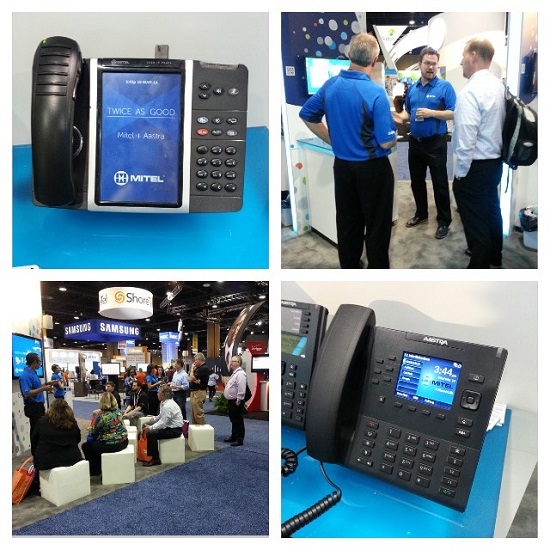 With this in mind, Mitel has partnered with Vidyo to power the video portion of their UC solution. Expect more coverage on this exciting partnership from TPO in the near future. 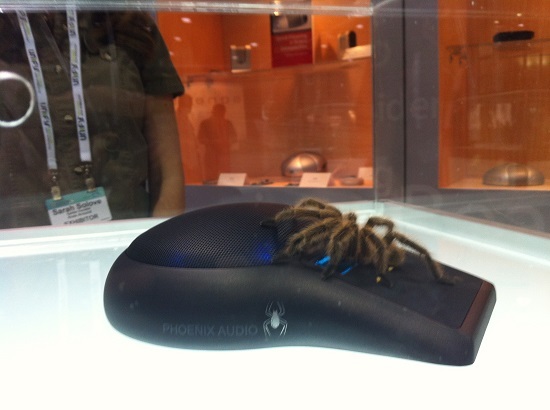 The new Phoenix Spider speakerphone was a big hit. Please check out our recent coverage for the details on this new product. While everyone seemed to enjoy the giant fake spiders on the outside of the booth, and the even scarier real spiders inside the booth (see below), the real star was the new speakerphone itself . During the demo I realized I missed a key feature in my earlier review, the ability to daisy chain multiple devices to cover large rooms. While daisy chaining speakers is nothing new, these can be powered by the same Ethernet cable transferring the audio signals. In other words, only the first speaker in the chain needs to be plugged in to power (or USB power). A full ceiling array can be installed without an electrician or electrical certification. Anyone who has installed powered devices in a ceiling knows what a huge cost saver this will be. We recently interviewed Ken Davison of Magor for a deep dive into their strategy and offerings. Magor's Aerus is more of a philosophy than a mere product. While the offering itself has evolved over recent years, its core workflow, allowing each user to have full control not just of what he/she shares, but of what he/she is viewing, has remained the same. The big question as far as product reach was simply waiting for it to be available on Windows. That time has now come and Aerus is ready for the mainstream Windows workplace. The Magor team was very amused by all the the buzz about the new Cisco Intelligent Proximity feature. After all that is exactly the kind of meeting dynamic Magor has been all about from the beginning.� While the Cisco feature isn't exactly like the Magor workflow, they both are working to address the user's desire to treat everything as a piece of glass, and choose what to view and share on any particular glass device at any time. I expect a lot out of today's audio technology. I'm easily pleased and often impressed, but it's tough to "wow" me. But the background noise reduction on the new Dolby / BT offering was something else. I sat inside their demo room using their new speakerphone. There were multiple people calling in from various locations. The wow moment was when they revealed that one of the remote participants was talking from a cell phone out on the exhibit hall floor. I was able to hear that individual as if he was in a soundproof room. The noise from the show floor was eliminated. It almost seemed fake, it was so good. Imagine that emergency meeting you have to hold when you are stuck at an airport terminal being as effective as one from the quiet of your office. There were a number of other power features, including fantastic echo cancelation, and a "spatial audio" feature that makes remote participants sound as if their voices are coming from different directions if you are wearing headphones. In practice it makes it a lot easier to quickly figure out who is speaking. TPO managed to get yet another demo account, so we will be sure to play with this some more and let you know what we hear (and don't hear). That is all for part 1 of our roundup. We spoke with a lot more vendors and we have a lot more to share, so please be sure to check back in the next few days for additional coverage. I got a very unique perspective on the Keynote sessions, as I was checking into the EC smartphone app during the event. It supports an internal feed of updates, similar to Twitter, that only the real geeks seem to have found. People were \"tweeting\" there a little more freely than they might on their real feeds. 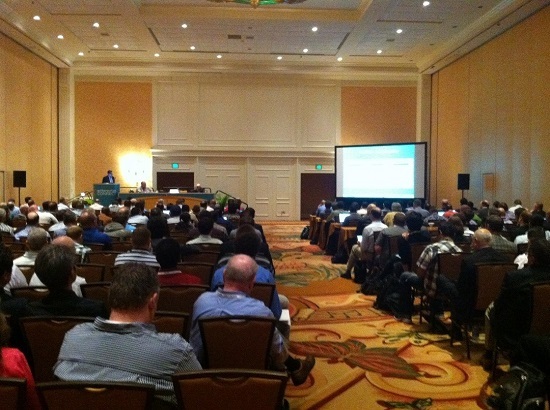 That being said, the buzz on Rowan Trollope's Keynote was very positive. Which is a bit surprising considering how much this crowd loves to beat up on the industry leader. Gurdeep Singh Pall from Microsoft (the man behind Lync) gave the final keynote. He had a great message, and presented it to what should have been the most receptive possible audience. Alas, ironically those closest beholden to the vision of visual collaboration and all of its benefits, may not be ready to hear it coming from Microsoft's lips. Regardless of who is doing the telling, the value of video communication, and the feel good, real life stories of how it is changing the world is a beautiful message. As an industry Pollyanna, I am very happy to have the big boys from Redmond joining in our chorus of Kumbaya. But my fellow analysts did roll a few eyes and mumble a few \"tell us something we don't know\" type of lines. Bottom line, Lync is a big part of the discussion and eventually it has to get video right. Microsoft is now a VC company, and a big part of our little world. Funny how times change. BlueJeans started out as the VC Company without an endpoint. A friend to all, sitting in the middle with no interest in competing with the endpoint vendors. When BlueJeans finally did create a browser based WebRTC plugin, they did so with little fanfare, and didn't call it an endpoint. I seem to recall them referring to it as \"an option\" for their users. Jump forward a year and the majority of their connections are now occurring over this \"option.\" Whether they admit it or not, BlueJeans now does endpoints, which means they have talent like Tedd Fox working on UI design. I took a peek at his latest iOS app and it was pretty slick. Very user friendly and clearly designed with iOS swipe / tap functionality in mind, not as an afterthought. Check out our recent coverage for more info about the industry leader in interoperability. As one of the heavy hitters in the UC market it is great to see Mitel taking a hard look at the video portion of their UC solution. Some UC providers seem to think that it is all about IM, with audio as a higher level of connectivity, and video as an afterthought. A UC provider that \"gets it\" wants to give their users all of the productivity, and quality of life, benefits of video as part and parcel of their offering. 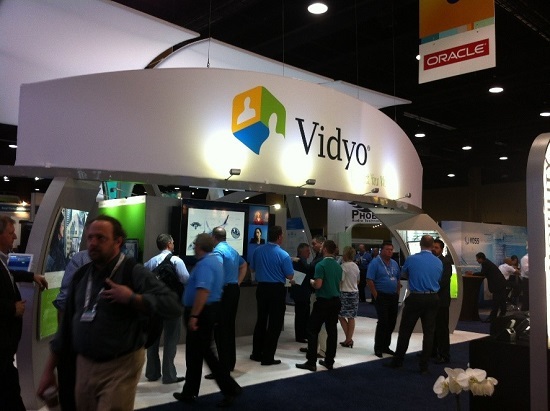 With this in mind, Mitel has partnered with Vidyo to power the video portion of their UC solution. 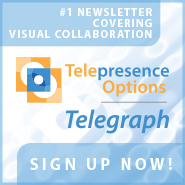 Expect more coverage on this exciting partnership from TPO in the near future. I expect a lot out of today's audio technology. I'm easily pleased and often impressed, but it's tough to \"wow\" me. But the background noise reduction on the new Dolby / BT offering was something else. I sat inside their demo room using their new speakerphone. There were multiple people calling in from various locations. The wow moment was when they revealed that one of the remote participants was talking from a cell phone out on the exhibit hall floor. I was able to hear that individual as if he was in a soundproof room. The noise from the show floor was eliminated. It almost seemed fake, it was so good. Imagine that emergency meeting you have to hold when you are stuck at an airport terminal being as effective as one from the quiet of your office. 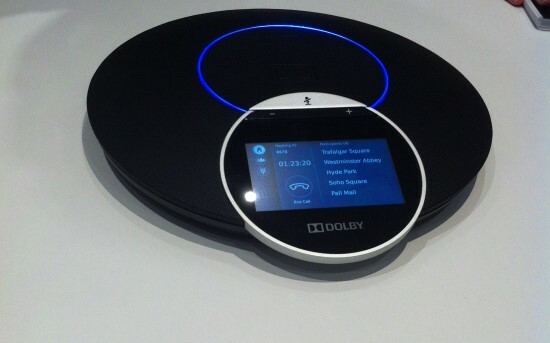 There were a number of other power features, including fantastic echo cancelation, and a \"spatial audio\" feature that makes remote participants sound as if their voices are coming from different directions if you are wearing headphones. In practice it makes it a lot easier to quickly figure out who is speaking. TPO managed to get yet another demo account, so we will be sure to play with this some more and let you know what we hear (and don't hear).